The goal of this mineral water bottle and label design was to increase visibility and legibility of the brand in points of sale, refine recently launched labels and create a differentiation through new PET bottles. An important aspect of the briefing was the need to emphasise advantages and differentials of the product. 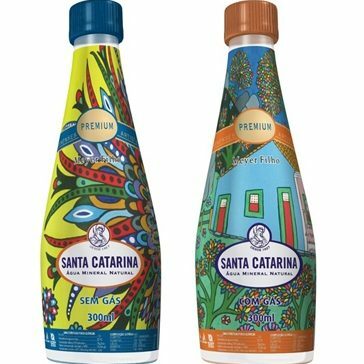 Santa Catarina Mineral Water was the pioneering company in the state and the mineral characteristics of the water places it among the best in the world for their neutral pH7 and a highly health beneficial mix of minerals. The product line is composed of 150ml to 20l bottles, whose labels were slightly modified to give them more highlight in points of sale. We created an organic form for the bottles, with ergonomics that permits easy handling. Some patterns were designed to add strength to the bottle structure. Above the label, we used high relief details representing the mountains of Serra do Tabuleiro, where the water´s source is located. At the bottom part of the bottle, low relief designed leaves reflect light when the bottle is filled, increasing the perception of the water and transmitting a feeling of freshness. The brand was awarded the 2006 and 2007 TOP of Mind prizes, for the most recalled name in Santa Catarina state, significantly increasing sales. We also developed packaging for the company´s premium line , click here and check.